Normandy cuisine conjures up images of lashings of cream , butter and cheese, but, also they are the pride of Normandy, a skilled chef will offer a very varied and not so over- rich menu.The region offers wonderful fish recipes as well. On the coast of Normandy you can feast on a vast platter of prawns or whelks. Oysters are very often eaten raw and at times gratineed and served hoe on a half shell. Scallops maybe served with a cream sauce or sauteed in Calvados or served raw and sliced very thin as “carpaccio”. 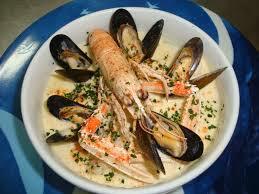 A lot of restaurants serve Moules Marinieres or a la creme, raie au beurre or marmitte dieppoise. Mackarel can be served soused in white wine or cider and served cold or hot with a sauce of mussels served cold or hot with a sauce of mussels. The Sole maybe served a la Normande or Meuniere sauteed in butter or just grilled. Chicken and veal are also served Vallee de l’ Auge style. Rabbit, ham or fish maybe braised in cider or cream. Cream can be served in baked vegetables gratins or stirred into spinach or green beans, just before being served. 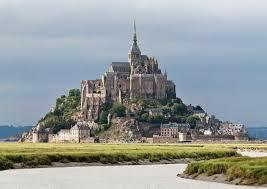 On Mount- Saint- Michel, La mere Poulard draws visitors from all over the world over the famous omelette. Farm fresh eggs are beaten into a froth in huge copper pans before being cooked in an open fire, the result is an omelette thick and fluffy . In Normandy cream is a dominante figure as well as apples served in dishes in numerous guises. You will also discover tarts and turnovers made with pears. This dish combines all the finest elements of Normandy’s cuisine. Mussels are cooked in shallots. butter and white wine; oysters are poached and sliced mushrooms are sauteed in butter. Sole fillets are in stock or on a bed of chopped shallots, then removed and kept warm while the liquid is reduced and thickened with creme Fraiche and egg yolks. 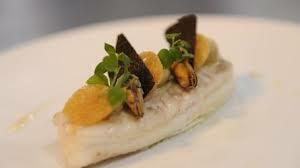 The sole is served with the sauce and garnished with the mussels, oysters, mushrooms and peeled prawns. Chicken is browned in butter and then flambeed in Calvados. Shallots and cider are added and simmered gently. Sliced mushrooms are sauteed in butter and poured, with their juices , into the pan, along with creme fraiche. Some cooks will tell you that the dish is only made with mushrooms and cream, not cider and Calvados. Tripes a la mode de Caen. This dish was supposedly created by a monk in Caen’s beautiful Abbaye aux hommes. It is very often featured on menus but you can also buy it ready made at any butcher’s. Strips and intestine of cow’s stomach and intestine are cooked with calves feet, onions or leeks, carrots, herbs and cider in a sealed casserole lined with slices of couenne ( rind). 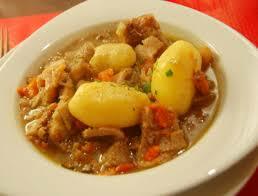 In a very low oven at least for 10 hours and is usually served with boiled potatoes. 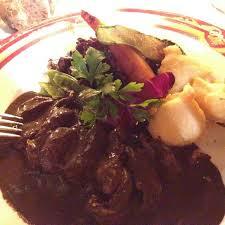 This is a Rouen specialty made with duck from Duclair which are strangled rather than bled. The duck is part roasted then jointed. The carcass is crushed to extract the blood and juices , which are blended with shallots and duck liver cooked in butter to make a rich , thick dark sauce, poured over the duck for the final roasting. Regional dining and On the menu.